The bedraggled Boston Braves were already in their familiar abode—the National League cellar—at 8-19 and 11 games out when they played their 28th game of the 1935 season. The venue was Pittsburgh’s bucolic Forbes Field; the opponents were the home-standing Pirates. But the Braves had Babe Ruth, a free agent newcomer to the National League, acquired at a high-mileage age 40 by Boston’s owner and erstwhile manager1 Judge Emil E. Fuchs2 when the Yankees cast the legend adrift on February 26. Although the Braves already had a “new Babe Ruth,” as writers tabbed popular slugger Wally Berger3, “the Judge liked to take on long-shot comeback players,”4 and Ruth became “a very big frog in a very small pond” when Fuchs signed him.5 He’d departed Boston 15 years earlier, when Red Sox owner-theater impresario Harry Frazee sold him to the Yankees. The Yankees had scorned Ruth in spring training by re-assigning his uniform number and using his locker for firewood as prelude to release.6 Fuchs brought him to Boston in the announced triple capacities of player, second vice president, and assistant manager,7 but the VP and assistant managerial posts were public relations fluff. Ruth’s playing days were essentially over, but after banishment by the Yankees, taking his celebrity to Boston seemed a better option than retirement. As the early season progressed, his new pond tended to engulf the overweight, weak-legged Babe. He had lifted spirits and made Fuchs look like a genius with an Opening Day home run at Braves Field against Giants’ ace Carl Hubbell on April 16. But through May 24 he was hitting just .153 with three home runs and five RBIs, three of which had come in the opener. Ruth’s curiosity value had resulted in his starting 22 of the team’s first 27 games, generally in left field, although manager Bill McKechnie often lifted him late for a pinch-runner or defensive replacement. This day in Pittsburgh, however, McKechnie had the Babe in his time-honored right field position, slotted third in the batting order in front of steady producer Berger. Pirate manager Pie Traynor started Red Lucas. The righty was in trouble before all of the recorded 10,000 in attendance had settled into their seats on a chilly Saturday afternoon. Boston shortstop Billy Urbanski walked and advanced to second on a sacrifice by second baseman Les Mallon, bringing up Ruth, slugging a paltry .305. 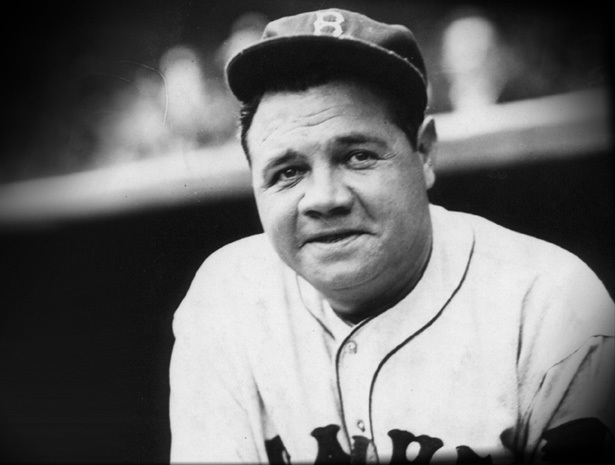 But the Babe, seeing yet another new National League pitcher, responded with some of his old-time pizazz and lofted career home run No. 712 into the right field stands to give the Braves a quick 2-0 edge. After Berger and first baseman Randy Moore both singled, Traynor yanked Lucas in favor of National League veteran Guy Bush, now toiling for Pittsburgh after 12 seasons with the Cubs. Bush induced a double-play grounder off the bat of left fielder Sheriff Lee to end the inning. Huck Betts, only two years Ruth’s junior at 38, was the Boston starter. He survived two hits and an error to hold Pittsburgh scoreless in the first, and then notched a perfect 1-2-3 second inning. Ruth batted for the second time in the Braves’ third. Facing Bush, who had hit him with a pitch in Game 4 of the 1932 World Series--with Ruth and the Yankees on the way to a demoralizing sweep of the Cubs--he retaliated with another homer to right. The shot, career No. 713, plated Urbanski again and upped the Braves’ lead to 4-0. Betts cruised through the third, but his 4-0 lead dissolved into a 4-4 deadlock in the Pittsburgh fourth on RBI hits by Gus Suhr and Tommy Thevenow and Earl Grace’s sacrifice fly. Still in a groove, Ruth added another RBI with a single off Bush in the fifth to put the Braves back on top, 5-4. Pittsburgh responded in the bottom of the inning with three runs on four hits, including an inside-the-park home run by second baseman Pep Young. The rally chased Betts as McKechnie needed Ben Cantwell to record the third out. The Pirates now led 7-5. No. 714 had closed the gap to a run13, and the Braves tied the score, 7-7, later in the inning. But Cantwell faltered in the seventh, allowing three runs. Larry Benton pitched the eighth for Boston, yielding another run. Waite Hoyt finished up for the Pirates and was the winning pitcher in their 11-7 victory. It’s sometimes reported that this memorable game was the Babe’s last. It truly was his “last hurrah,” but he went on to play in five more games, without a hit in 13 plate appearances. Throughout May, Fuchs, Ruth and McKechnie had come to the conclusion that Ruth’s retirement, sooner rather than later, was in the mutual best interest. He made it official in early June after pinch hitting in the first game of a doubleheader in Philadelphia on May 30--the same day his May 25 feats were noted without fanfare in a Sporting News “Highlights of the Week” column. Cicotello, David and Angelo J. Louisa, Eds., Forbes Field (Jefferson, NC: McFarland & Co., 2007). Fuchs, Robert S. and Wayne Soini, Judge Fuchs and the Boston Braves (Jefferson, NC: McFarland & Co., 1998). Dvorchak, Robert, “Ruth Had Final Hurrah At Forbes 75 Years Ago,” Post-Gazette.com, May 25, 2010 (Accessed March 27, 2014). Wood, Allan, “Babe Ruth,” SABR Biography Project, sabr.org. The Sporting News, May 30, 1935, 5. The Sporting News, June 13, 1935, 4. 1 Fuchs owned the Braves from 1923 through 1935 and out of frugality assumed the field managerial reins as well for the 1929 season. Fuchs, Judge Fuchs and the Boston Braves, 68. The team finished 8th, at 56-98. For 1930, Fuchs plucked future Hall of Fame manager Bill McKechnie away from Cardinals’ owner Sam Breadon. Ibid., 83-84. McKechnie had managed the 1925 Pirates to a World Series victory. He was still at the Braves’ helm in 1935. Baseball-Reference.com. 2 “He served briefly as a real judge [in New York City], but the name was his ever after.” Fuchs, 11. 3 Ibid., 84-85. The Braves acquired Berger from the Pacific Coast League Los Angeles Angels in late 1929. He hit 38 home runs and drove in 119 runs in his rookie 1930 season, kept slugging, and capably anchored center field to earn the acclaim of Braves fans with little else to cheer about. 9 Cicotello, Forbes Field, 2, 42. 10 Dvorchak notes that Warhola, 12 years old, was selling newspapers in the ballpark that day. 11 Dvorchak quotes Creamer’s 1974 book Babe: The Legend Comes To Life. 12 Dvorchak quotes Tom Foreman’s 1995 interview with Brown for the Associated Press. 14 The Sporting News, June 13, 1935, 4.